We bought our tickets, we knew where we were going the week after Christmas, and we — and the dog — were looking forward to miles of walks along San Diego’s beaches and parks, and to catching a few rays in the big backyard of our modest bungalow, where the bloom is never off the rose. 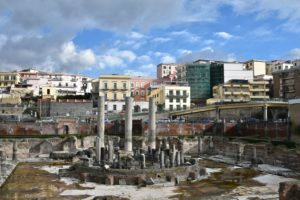 But an even better plan was presented to us by good friends, who are also first-class traveling companions: join them on a guided tour of Pompeii, Herculaneum, and Naples. We hadn’t been to that part of Italy since 1983, and on that day many moons ago it was 107 degrees when we roamed the ruins with our then 5- and 3½-year-old sons. 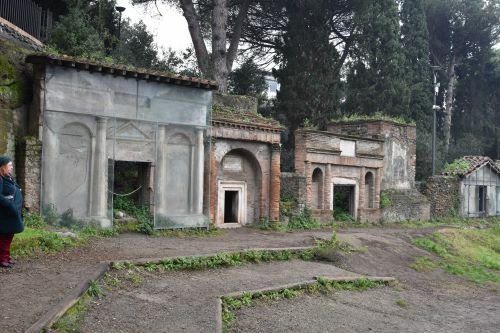 Yes, they were excited to be in an area where gladiators once fought, but they were keenly disappointed to discover that Mount Vesuvius had already erupted. 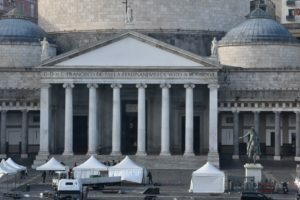 Having recently fallen hard for a series of novels by Maurizio de Giovanni about a Neapolitan police commissioner, or maybe the mesmerizing commissioner himself, that take place between the end of the first World War and the beginning of the second, I was suddenly intrigued to explore the Mezzogiorno. 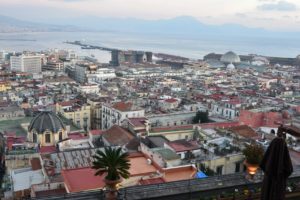 While we stayed in a well-appointed and fresco-filled former 16th-century monastery in Naples, the San Francesco al Monte, and our room overlooked the Gulf of Naples, I would have to agree with author de Giovanni that Naples is best viewed from a distance. It is as gritty as it was 35 years ago, and danger always seems to be lurking around every dirty corner. But it is also rich in art, archaeology, and history. Andante Travels took us to every corner, other than Elena Ferrante’s neighborhood, which two of the members on our trip were determined to discover on our afternoon off. We gladly followed but left them after an hour of traveling the city’s poorest streets, where African immigrants were struggling to sell wares no one was interested in buying. The mosaics at the National Archaeological Museum are luminous. A visit to the excavated market and streets below the cloister of Santa Chiara was the beginning of our education about everyday Roman life. And what a full and accomplished life it was. What didn’t the Romans, or Greeks, invent, achieve, establish or first build? More importantly, is every American child still learning Greek and Roman history? One day in Pompeii is not enough. In an ideal world, one would spend a year there unearthing more treasures buried by the volcano in 79 A.D. and wandering the ruins. Seventeen years before the eruption of Mount Vesuvius, Herculaneum was buried by “pyroclastic” surges. We saw the skeletons of many who were trapped and what remains. In Pozzuoli we walked through an amphitheater designed by the same architects who built the Colosseum. That was indeed impressive, but in some ways less remarkable than Piscina Mirabilis, the ancient cistern, which stored drinking water for the western Roman fleet. Everyone on the tour lingered below ground to appreciate this engineering achievement and listened intently as our guide, John Shepherd, brought us closer to enlightenment. One of the things I’ll remember most about Naples was our tour group, which was mostly British citizens, all well-educated, delightful, and curious. At breakfast the first day, we agreed not to talk about Brexit if they agreed not to talk about our President. We kept to that rule until the next to last night when we were comfortable enough to discuss anything, including the future of the Royal Family, with ease. From Naples, my husband and I took a train to Rome, where we explored more ruins, visited a number of glorious palazzos and churches for the first time, got into the Vatican Museum early enough to truly appreciate the glories of Raphael and Michelangelo, and stayed in Trastevere, on the other side of the Tiber River, in, of all places, a converted nunnery.